The state archaeology department has chanced upon a hoard of old coins that might offer a treasure trove of information on the Gupta kings and lead to the discovery of the Mrigasthapana stupa mentioned by Chinese travellers. The coins, made of gold, were found on May 31 in a heap of soil, kept by the National Highway 34 for its extension near the Ahiran bridge over the Farakka feeder in Murshidabad. “It has been reported that there were about 100 coins. If it was so, then it is very rare. Such a hoard has only been found once, in Kalighat in the colonial era,” said Gautam Sengupta, the director of the state directorate of archaeology and museums. The number of coins that were buried in the soil is difficult to ascertain because residents of nearby villages and workers made off with most of them. A preliminary study of the 11 coins recovered by police, together weighing 94 grams, indicates that they belonged to the Gupta rulers — Samudragupta, Chandragupta and Chandragupta II or Kumaragupta. The Guptas ruled between the 4th and 6th centuries. The coins will be handed over to the state archaeological museum after the directorate completes formalities and receives the approval. Amal Roy, the deputy director of the state archaeology directorate, feels the coins were unintentionally transported to the spot where they were found along with the soil used during road building. Workers said the soil might have been transported from the Gonkar- Haatpara regions of Sagardighi. 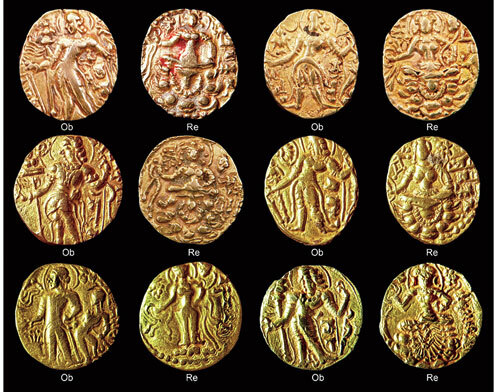 A team from the archaeology department sent to identify the original source of the coins feel that they came from an area located about 10km from Ahiran, towards Behrampore. They have identified three mounds at Baidpur, Katna and Mathurapur villages as the possible sources. While the mounds at Katna and Mathurapur had almost completely been dug up by mechanical excavators, a portion of the mound at Baidpur remains intact, thanks to its local identity as a religious spot. “The Baidpur mound has revealed a lot of pottery, which seems to be from the Gupta and post-Gupta eras. The fact that the area around it is largely uninhabited and uncultivated might be of great advantage to us. We feel confident that this is the original site and will conduct further explorations and a large-scale excavation this year,” said Roy. According to Sengupta, the proximity of the find to the river Hooghly “reminds us of the historical debate regarding the homeland of the Gupta kings”. The ancient text Vayupuranamentions that the Gupta kings ruled over a large territory across the Ganga, Prayag, Saket and Magadha. But scholar D.C. Ganguly had pointed out that Chinese travellers had noted that the Guptas had made large donations for the Mrigasthapana stupa, which according to him was in Murshidabad, the homeland of the dynasty. But in the absence of evidence, most historians have accepted that Mrigasthapana was Sarnath in Uttar Pradesh. The hoard of coins by the highway might lend validity to Ganguly’s theory. The size of the cache implies that the site where it had been buried was important and secure, perhaps near a major stupa or a vihara, which symbolised Gupta might. “If we are able to find the place where these coins had originally been buried, we can start looking for a stupa around it,” said Sengupta. The government may strongly advice the villagers to return the coins to the authorities. Anyone turning in their find will be compensated according to provisions of the Treasure Trove Act. “All those who return the coins will be rewarded. Legal action may be taken against those who don’t,” said Roy.